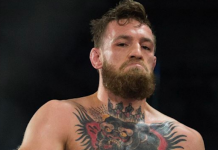 Last Thursday, Conor McGregor arrived at the Barclay’s Center in Brooklyn, New York—the host venue for UFC 223—and all hell broke loose. Even by McGregor standards, it was a terrible scene, as the Irishman and his cronies attacked a shuttle bus containing a number of UFC 223 fighters. In video footage of the fracas, McGregor could be seen shelling the bus with whatever he could get his hands on, including a dolly, which he used to smash the back window of the vehicle. The fallout caused by this frenzy was severe and extensive, as McGregor’s training partner Artem Lobov was forced out of his UFC 223 bout with Alex Caceres for his role in the ordeal, Michael Chiesa was forced out his main card lightweight bout with Anthony Pettis with facial lacerations, and Ray Borg was pulled from his flyweight bout with Brandon Moreno as a result of glass debris in his eye. Pretty much everyone has condemned McGregor for this insane rampage, and that includes UFC featherweight champ Max Holloway. While Holloway believes McGregor was out of line, however, he doesn’t believe the Irishman meant to break the bus window with the dolly he threw. Needless to say, the featherweight champ feels for all the fighters that were forced off the UFC 223 bill due to McGregor’s crazed rampage. What do you think of Max Holloway’s take on the Conor McGregor situation? This article first appeared on BJPenn.com on 4/10/2018.